Home BOLLYWOOD Have You Seen The Trailer Of Randeep-Kajal Starred Do Lafzon Ki Kahaani? Have You Seen The Trailer Of Randeep-Kajal Starred Do Lafzon Ki Kahaani? [tps_footer]Bollywood’s hot hunk and brilliant actor Randeep Hooda has amazed us with his acting skills in Kick, Sarbjit, and we are waiting to see him in Sultan. Randeep Hooda will be coaching Salman Khan as a wrestler in Sultan and it’s already making us curious to watch Salman Khan, Randeep Hooda, Anushka Sharma, Amit Sadh together in one frame, in one film, Sultan releasing this Eid but now Randeep is more than happy to share with all of us about his new movie Do Lafzon Ki Kahaani starring Kajal Aggarwal. Its’s directed by Deepak Tijori and DLKK is et to release on June 10 and it’s trailer is worth watching. Both, Randeep Hooda and Kajal Aggarwal have acted well and have shown a very simple and intense chemistry on screen. It’s hard to put it in words, you need to watch the trailer in order to understand the pain, feelings, the journey of Randeep and Kajal‘s characters. And, yes there is a lot of real hard hitting action in this movie as Randeep is playing a wrestler and it’s a remake of a Korean movie Always which adapted into Kannada movie Boxer in 2015. 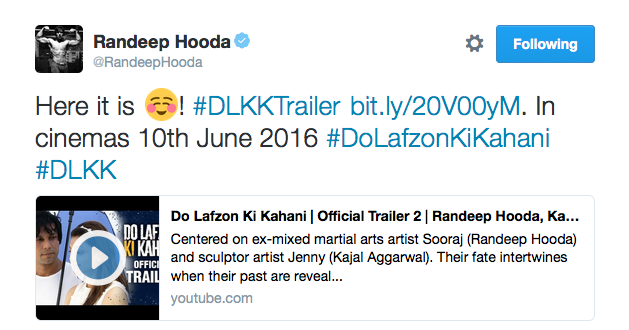 Here’s the tweet which Randeep Hooda has shared with all his fans and followers who were eagerly waiting to see the chemistry of Randeep-Kajal and know the storyline of his upcoming movie DLKK. Previous articleUnbelievable! This B-Town Couple To File For Divorce?